The MBTA board will hear a request to pump a fresh $3 million into the Mattapan high-speed trolley line next week as state officials await a consultant’s report that will detail how much it costs to operate the line and lay out options for the future. The fleet of Presidential Conference Cars that are used on the line are at “the end of their life,” according to Jeff Gonneville, the T’s chief operating officer, who spoke to the Reporter on Tuesday. Gonneville said that an engineering firm will be soon be asked to compile a study on the line that will itemize its costs, the viability of the vehicles and infrastructure – including bridges and the right of way – and the prospects for keeping the line in operation, either with the trolleys or with different vehicles. Gonneville expects the report will be completed by this summer. In the meantime, the request for new funds to maintain the line in its current form is an acknowledgement that any changes – in the form of new or restored trolleys, repurposed Green Line cars, or a more radical departure, like electric buses – are years away from implementation. Gonneville said that the consultant has been asked to scope out a “menu of possibilities” for the future of the line. The MBTA board will be presented with the options later this year and any change to the current system would be subject to community review, he said. The MBTA now has ten PCC cars available for the Mattapan line, survivors of what once was a much larger fleet. The cars were refurbished in the late 1990s, but with few or no replacement parts available for some of the key components, certain pieces, like brakes and valves, are engineered, cast, and installed by skilled tradesmen at the T’s Everett Shops facility. Other, larger components – the original engines and air compressors – are routinely maintained by T workers with an eye toward preventing larger problems from becoming fatal flaws for the antique conveyances. Gonneville first introduced the notion of a thorough review of the line’s future during a January meeting of the T’s Control Fiscal and Management Control Board as part of a larger briefing of the state of the authority’s vehicle fleets. The mere notion of studying a potential change to the line sparked immediate pushback on social media. 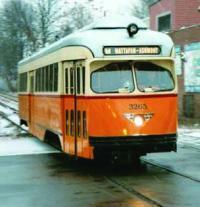 The Save the Mattapan Trolley Facebook page now counts 1,538 members. The request for funding comes as MBTA officials prepare to unveil a five-year spending schedule – called the Capital Improvement Plan – which will itemize plans for procuring new vehicles, building stations, and maintaining the current fleet. The MBTA board is expected to vote on the proposed CIP in May following a series of public meetings on the options.